LAWRENCE, Kan, April 23, 2009– HiPer Technology is expanding their CF1 line into the new red and blue CF1-R and the entry level CF1-A wheel. 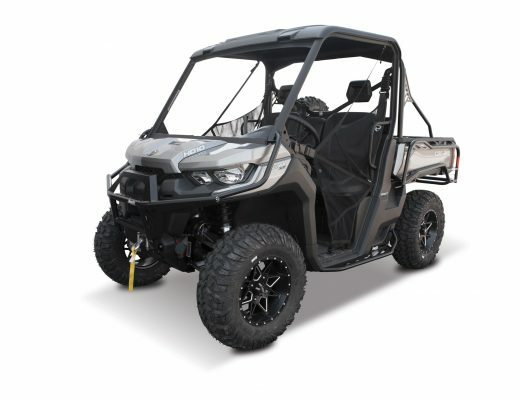 The CF1-R retains the design features of the original CF1, but for the first time ever is available in colors to match your ATV. The CF1-R can be ordered with a red, blue, or standard black inner half and center section. All single beadlock CF1-Rs will be shipped with matching color beadrings. At 2.7 times tougher than wheels made from 6061-T6 aluminum, the CF1-R lives up to HiPer’s reputation for superior performing products. The CF1-R retains the modular design features that made the CF1 the choice of top professionals like the Bomb Squad and GNCC race winner Bryan Cook. Pricing for the CF1-R begins at $159.99 for non-beadlock wheels and $204.99 for single beadlock designs. Originally shown at the 2009 Indy Dealer Expo with a great response, the new CF1-R is now available, and can be ordered from dealers nationwide, or by calling HiPer direct. HiPer Technology, Inc is a Kansas company specializing in carbon fiber and composite products utilizing a proprietary casting process. HiPer is the industry leader in ATV wheels, Micro Sprint car wheels, and safety products. HiPer Technology has grown to be a technology leader in materials, design, and product function since its founding in 2000. Please visit www.hiperracingwheels.com, see your local dealer, or contact HiPer at 877-GO-HIPER (877-464-4737) to place your order. HiPer wheels are proudly designed, made, and assembled in the United States.